Nearly 10 Percent of America's Stealth F-22 Raptors are Damaged. Here's Why. Hurricane Michael damaged potentially more than a dozen U.S. Air Force F-22 Raptor stealth fighters at their base on the Florida panhandle on Oct. 10. That's nearly 10 percent the Air Force's F-22s. And if Japan's own recent experience is any indication, it could take the flying branch years to recover from the loss of so many planes - even if the loss is temporary. Hurricane Michael struck northwest Florida as a category-four storm. As it roared across the state's panhandle region, the storm flattened whole towns and killed at least 18 people. Tyndall Air Force Base, the main training facility for the Air Force's 183-strong F-22 force, lay directly in the hurricane's path. Prior to the storm, the base housed 55 Raptors. Tyndall's wing includes several training units and one combat-ready F-22 squadron that has flown combat missions over Syria. At least 33 of the radar-evading jets evacuated to Ohio in the days before the storm made landfall. Some of the others were unflyable and remained at Tyndall along with the base's "stay-behind" staff, who moved grounded aircraft into hangars, closed the doors and hoped for the best. The unflyable jets reportedly included one that suffered a mechanical problem while attempting to take off on its evacuation flight to Ohio. Many of the others were grounded because they were missing key spare parts. The Air Force routinely "cannibalizes" a portion of its planes, stripping them of parts in order to keep others flightworthy. As of March, Air Force statistics indicated just half of the Raptors were "mission-capable," Air Force Times reported. The rest had been cannibalized, were grounded for repairs or lacked key upgrades for frontline duty. The storm's winds, which peaked at 150 miles per hour, damaged every hangar at Tyndall, The New York Times reported. Photos that appeared online showed hangars missing roof panels - and the distinctive shapes of F-22s inside the wrecked structures. Crews quickly began assessing the damage. "What I can say is that today is a better day than yesterday, and things are going to keep getting better," Col. Brian Laidlaw, commander of the base's 325th Fighter Wing, statedon Oct. 13. "Each day we recover more of Tyndall Air Force Base." The storm damaged as many as 17 F-22s, Foreign Policy reporter Lara Seligman tweeted on Oct. 14. U.S. taxpayers paid around $380 million apiece, including development costs, for a total of 195 F-22s. Several of the twin-engine jets have crashed. The Air Force has retired a few examples that mostly flew test flights. 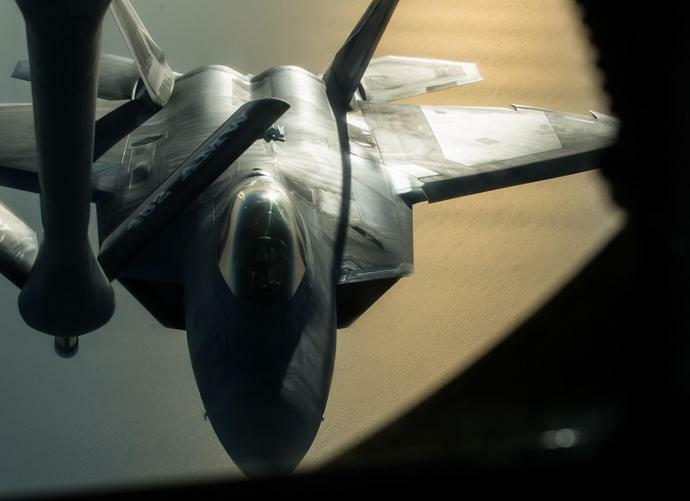 For years the Air Force insisted it required 381 F-22s, a figure that the service said would allow it to fully equip frontline squadrons while also letting it keep some planes in "attrition reserve" to replace destroyed jets. But to save money Robert Gates, then the secretary of defense, ended F-22 production in 2011 after Lockheed Martin had built just half as many jets as the Air Force said it needed. Now there are no extra Raptors, Dave Deptula, a retired Air Force general, told The Daily Beast. "No F-22s bought for attrition reserve means every one lost negates our combat capability." The Air Force has indicated that some or all of the Raptors that stayed behind at Tyndall are repairable. "Our maintenance professionals will do a detailed assessment of the F-22 Raptors and other aircraft before we can say with certainty that damaged aircraft can be repaired and sent back into the skies," Secretary of the Air Force Heather Wilson, Air Force Chief of Staff Gen. David Goldfein and Chief Master Sergeant of the Air Force Kaleth Wright said in a joint statement on Oct. 15. "However, damage was less than we feared and preliminary indications are promising." But the Air Force has long explained that even 183 Raptors is too few, at a time when China is also developing its own stealth fighters. "We don't have enough F-22s," Gen. Herbert Carlisle, then the head of the Air Force's Air Combat Command, said in 2015. Three years later, China is steadily expanding its own force of J-20 stealth fighters and the U.S. Air Force could be down to as few as 166 F-22s, at least temporarily. And even a short-term reduction in the number of flyable F-22s could have long-term implications. The Air Force is struggling to both grow its total number of squadrons from 312 to 386 in order to keep pace with China and to erase a 2,000-pilot shortfall by training more aircrew, an effort that requires more training flights. At the same time, Defense Secretary James Mattis has ordered the armed forces to boost fighter readiness to 80 percent by September 2019. The F-22 force, accustomed to keeping just half of its planes mission-ready, could struggle to improve its overall flightworthiness while also repairing wind- and water-damaged planes. This year the Air Force devoted 25,000 man-hours to restoring to flight status a single F-22 test jet that the service had put into storage in 2012. Fixing each of Tyndall's planes could require similar effort. Air Force Secretary Wilson recently ruled out paying Lockheed Martin billions of dollars to restart Raptor production. Japan has suffered through a similar crisis. The tsunami that struck Japan in 2011 flooded an air force training base, inundating 18 of the Japanese air arm's 98 high-tech F-2 fighters. The country spent $800 million repairing 13 of the planes, finally fixing the last jet in February after a seven-year effort. While working on the water-damaged jets, the Japanese air force had to relocate its training efforts to Arizona. Tokyo also accelerated a multi-billion-dollar program to design and build a new fighter, in part to compensate for the sudden loss of F-2s. The F-22 is a more sophisticated and delicate aircraft than the F-2 is. Repairing even a few storm-damaged F-22s could cost billions of dollars, require years of work and hold back the Air Force's efforts to grow and improve its readiness.